better than i could have imagined: Grace's Quilt....is REALLY finished! So three...THREE years ago I started this quilt for Grace. This is honestly the very first thing I ever sewed. So it's kind of special to me. 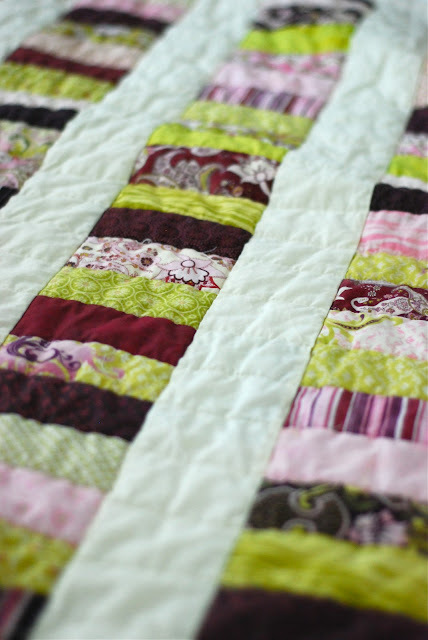 ;) I finished piecing the top together back in January of 2010...just 3 weeks from my due date. But I even spent months before that....going back and forth over which fabric to use...and then the cutting of the fabric...and then making of lots of mistakes! So after finishing the quilt top...I just needed to quilt it. Easy enough? And it is finally done!! And I can't tell you how happy I am! And this gal is pretty happy too! It's a crib size...but even still...it should be good for her for a while. I can't believe this is your first sewing project! I want to learn to sew...but I am super duper intimidated! You should be very proud! So cute!! Glad you are finished with it! Such a great memory for Grace to have!! Yay! Congrats on your first quilt!!! You did an amazing job! The sense of joy and pride at the end of a finished project is what keeps me sewing. I love everything about it! 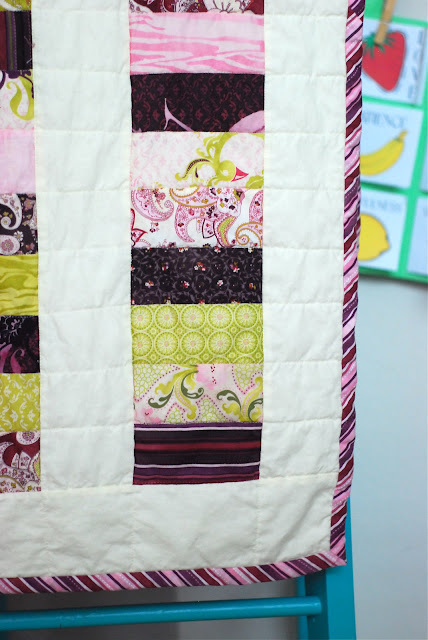 I love your colors and your backing fabric and how your binding is such a fun pop of color! It's beautiful! Grace will have this keepsake forever! a full week of firsts!